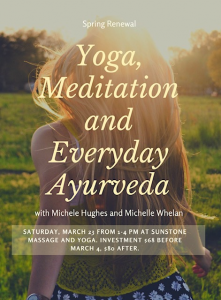 Spring Renewal: Yoga, Meditation and Everyday Ayurveda. We are limiting the class to 8 students, we recommend you register soon. THANK YOU, the workshop is FULL. Please call for waitlist.